Home / Beauty Swap / Pakistani Beauty Blogggers Community / PBBC / Secret Swap / Swap / Pakistani Beauty Bloggers Community Secret Beauty Swap!!!! Pakistani Beauty Bloggers Community Secret Beauty Swap!!!! Not so long ago we at Pakistani Beauty Bloggers Community arranged a Secret Beauty Swap among beauty bloggers from Pakistan. The suggestion was given to us by one of my dearest fellow blogger Atia from Makeup Monolouge. This was almost alike Secret Santa where everyone got randomly paired up after with each other after deciding the minimal budget. The fun part receivers HAS to guess who is the sender. And believe you me that was the most AMAZING part of this whole activity. After idea was presented by Atia, I and Sarah from Glossicious Beauty Blog brainstorm the whole thing then present the idea on Pakistani Beauty Bloggers Community fanpage on Facebook and we had some seriously amazing responses that we were not hoping actually. Saeed Ghani Fair Plus Herbal Mask. Saeed Ghani Skin Glow Whitening Mask Powder. Pupa Milano 4Eyes Omretti Palette in no.2. Pupa Milano Lip Perfection Natural Shine Lip Gloss. Lip Smacker Duo in Berry Kiss. MUA Cream Blusher in Yummy. Luscious Signature Lipstick in No.7. Aps Oriental Princess Makeup Remover Sheet. And what I love the most is that beautiful hand written letter. I was completely over-whelmed actually. Please show your support for the Pakistani Beauty Blogging Community by liking us there on Facebook page and do not hesitate if you are Pakistani and living abroad. Do let us know about your blog and we will enrolled you in our blogroll. Oh !! 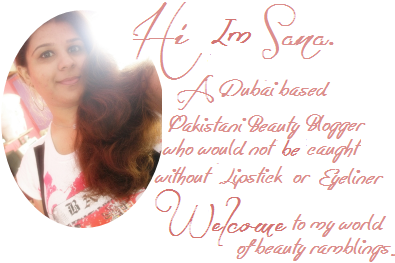 And by the way I'm one of the Admin of Pakistani Beauty Blogger Community , all thanks to Sarah from Glossicious Beauty Blog and Pakistani Beauty Blogger Community Creator. On ending note, I just want to thank Atia for giving us such wonderful idea along with Farah for sending me such wonderful products and to all my beauty bloggers out there who took part and who are a great support to us. 35 comments on "Pakistani Beauty Bloggers Community Secret Beauty Swap!!!!" i need to try more beauty stuff!! You have a lot of good there, it would be nice to try a swap! That is awesome..I always enjoy seeing reviews on products from different countries!! Enjoy your items! You got some amazing stuff, specially Pupa (I have their brushes)! When will you be holding the next one?? GIG should totally do a swap like this! im not familiar wth the products, makes me wanna try them all! nice comunity! loving the MUA blush!! i have been thinking to get some of their blushes! Looks like great stuff! I remember Lip Smacker! Please check out my blog! I'm new at blogging and if u check it out it il make my day! Great to know about pakistani beauty blogger community i like it a lot.